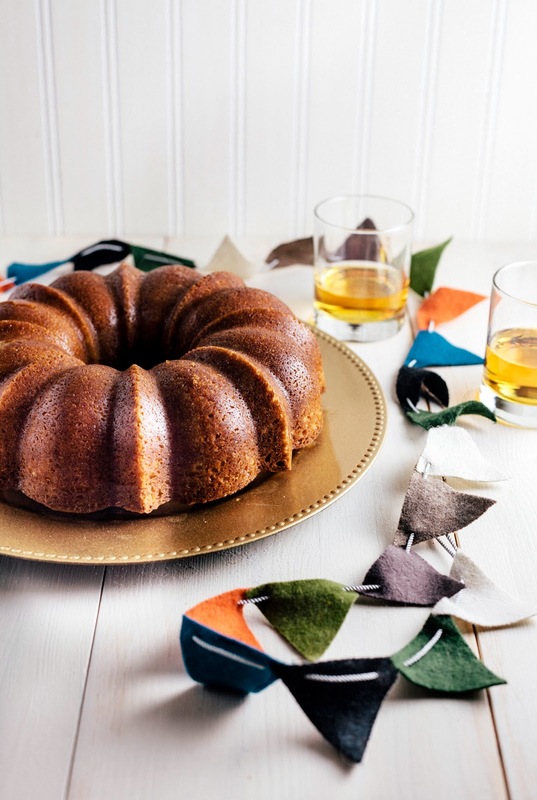 A year and a month ago, I posted this recipe for Kentucky Bourbon Butter Cake on my blog. 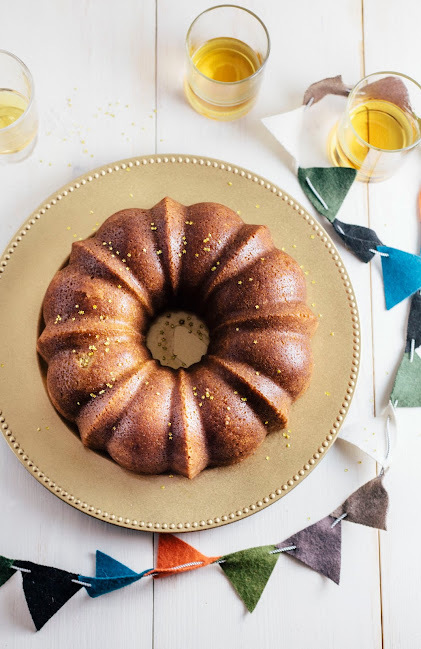 It was one of my absolute favorites — an incredibly buttery and moist buttermilk cake, soaked and topped in a buttery and sugary whiskey glaze. Unfortunately, I took the pictures before I had gotten the hang of my artificial lighting. The resulting images were oddly colored and didn't do justice to the cake. I swore in my 2012 recipe roundup that I would remake this cake in 2013 to give it the pictures it deserved. And I'm just barely making the deadline, because here it is. 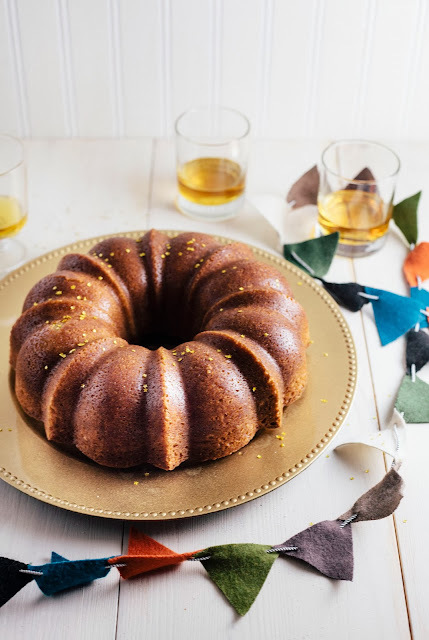 My beloved Kentucky Bourbon Butter Cake recipe from Vintage Cakes, but this time with beautiful pictures that capture the cake's spirit. I'm excited about this recipe for a couple of reasons. The first is that I rarely get to remake the recipes that I love — I guess one of the curses of food blogging is that I have to make new things each week for the sake of variety. But the second and perhaps most important reason why I'm excited is that this cake is absolutely delicious. I wrote in 2012 that it was one of the best cakes I've ever made, and I'm happy to say that my statement still holds true. So this is how I'm celebrating the start of 2014 — a party with this beautiful, boozy cake alongside of a couple glasses of neat bourbon whiskey. I've gotten a couple questions from people who are concerned about the cake's alcohol content and whether this recipe is kid-friendly and/or whether they can serve it to friends/family who don't drink. No and NO. Because GUYS. This is a bourbon cake. It's supposed to taste like bourbon. It's topped off with a glaze primarily made from alcohol. Come on now. Speaking of the bourbon butter glaze, it can be played in two ways. In the recipe, I've included the way I like it — where the sugar isn't fully melted, and each bite leaves a slightly crunchy, crystallized crunch. The other way is more traditional, with a fully melted sugar glaze that soaks through easily. If you prefer this way, combine all the ingredients for the glaze together in a medium sauce pot over medium-low heat and continue stirring until the sugar is fully melted. Center an oven rack and preheat the oven to 350 (F). 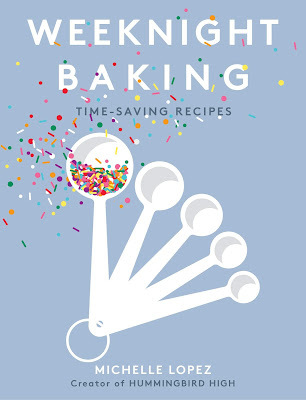 In a medium bow, sift together 3 cups cake flour, 1 teaspoon baking powder, 1/2 teaspoon baking soda, and 1 teaspoon kosher salt in a bowl, then whisk the mixture by hand to ensure that all ingredients are well mixed. Set aside. In the bowl of a freestanding electric mixer with a paddle attachment, cream 1 cup butter, 1 1/2 cups granulated sugar, and 1/2 cup brown sugar on medium-high speed until fluffy, about 5 minutes. Turn down the mixer to its lowest speed and add 4 eggs, one at a time, making sure each egg is fully incorporated before adding the next one. Whisk together 1/4 cup bourbon and 1 cup buttermilk together in a liquid measuring cup. Set aside. With the mixer still on its lowest speed, add the flour mixture (from the first step) in three parts, alternating with the bourbon and buttermilk mixture (from the fifth step) in two parts, beginning and ending with the flour. After each addition, mix until just barely blended and stop and scrape the bowl. Stop the mixer before the last of the flour has been incorporated and complete the blending by hand with a rubber spatula. Pour the batter into the prepared pan and use a rubber spatula to spread it out evenly. Place the pan into the preheated oven and bake until the cake is golden and springs back when touched, about 40 to 45 minutes. When the cake is ready, remove from oven and let rest on a cooling rack. Make glaze immediately. Place 6 tablespoons unsalted butter in a small saucepan over medium heat. Continue cooking the butter, using a heatproof rubber spatula to swirl it around occasionally, until fully melted and the butter begins to brown, turn foamy and emit a nutty aroma. Remove from heat immediately and allow to cool for 1-2 minutes. Add 3/4 cup sugar and 1/4 cup bourbon to the slightly cooled butter, whisking gently to combine. Only whisk until the ingredients have just evened out through the mixture — but be careful not to over mix, the mixture should still feel slightly grainy. Use immediately. When the cake is fresh from the oven and cooling on the wire rack, leave it in the pan and poke holes all over the exposed top (or, what will eventually be the base of the cake) with a wooden skewer. Pour three-quarters of the prepared glaze slowly over the cake, saving the remaining glaze. 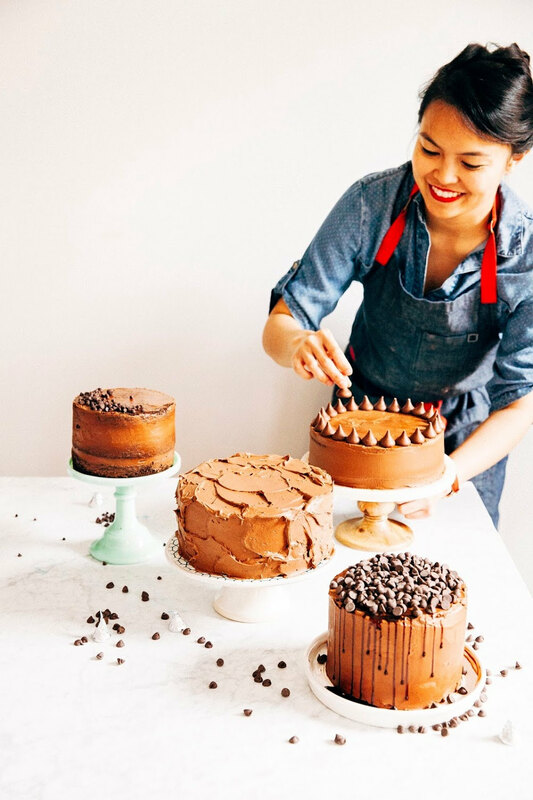 Use a rubber spatula to spread the glaze around the cake top, making sure that the glaze seeps in the holes you made with the wooden skewer. Allow the cake to cool for 30 minutes, then flip it out onto a serving plate so that the glazed part is on the bottom. Brush the top with the remaining glaze — if the glaze has thickened, rewarm it over low heat and use immediately. this is soo pretty!!!!! i've been being such an old lady lately and not going out that i think my tolerance is prolly low enough that i'd get drunk off one slice. Mmmm. Elegant photos as usual. :) Happy 2014. Happy new year! This cake looks so good - love the sheen you've got from that glaze. ...did I forget to mention I'm a Kentucky girl! so are going to try this ! Do you suppose rum would work instead of the whiskey? Nice working.Planning a top dinner party should always start with hiring a well organized party caterer. A caterer is a person that is trained and educated in preparing and serving food to guests. I made this cake for my husbands birthday last week per his request. I wasn't too keen on the idea of a bourbon cake but it totally exceeded my expectations. It was so delicious and I will definitely make again. Thanks for sharing the recipe. Beautiful pictures, too! Hi Michelle. I baked this before. The cake was all finished within the next hour.